This is a quick and delicious meal that looks elegant but is perfect for a weeknight meal. I serve it with Crispy Smashed Potatoes and steamed broccoli. It’s very quiet when the family eats this meal. Very.Quiet. The original recipe calls for chicken cutlets, but I like to use skinless, boneless chicken thighs. Chicken thighs are more flavorful than cutlets. You can often buy these thighs on sale. Buy several packages. Remove any extra fat, pound them to uniform thickness and toss them in the freezer. You can use these for a delicious Chicken Parmesan as well. Heat the oven to 300 degrees. Put the flour on a plate or shallow bowl next to the stove. Put the chicken between plastic wrap and pound with a heavy pan, until the chicken is uniform in thickness. Place chicken on a cookie sheet and season with salt and pepper. Put oil and 2 tbsp. butter in a large skillet over the medium-high heat. When the butter has melted, dredge the chicken, one piece at a time, through the flour, shaking off any excess. Place chicken in hot pan, repeating the dredging with the next piece of chicken. Work in batches to avoid crowding the pan. Throw out any remaining flour. Cook the chicken for about 3-4 minutes on one side before turning the chicken over. You want to brown both sides of the chicken. Once the second side has browned, remove the chicken from the hot pan and place it in an oven safe pan. You can check for doneness by cutting into a piece. If it’s still pink, cook it a little longer on the stovetop. Once all pieces have been cooked on the stovetop, place the chicken in the oven while you make the pan sauce. This will keep the chicken warm and finish cooking any pieces that may not be quite done. Add the wine to the skillet, keeping the heat at medium-high. Let the wine reduce by half, while you scrape the brown flavorful bits from the bottom and sides of pan. Add the water or chicken broth and continue to stir until the liquid has thickened slightly and reduces a bit more. Add a tablespoon of butter to the skillet and swirl the pan around until the butter is melted. Add the parsley. Turn off the heat. The first time I made this I measured exactly. You don’t really have to. I like to make extra sauce so I eyeball it. You can do this when you cook, not bake. Taste as you go along. You can add salt or more water if need be. Remove the chicken from the oven. Spoon the sauce over the chicken, squeezing the lemon juice over the chicken. Sprinkle with additional parsley for garnish if you’d like. This is a perfect recipe if you’re cooking for yourself or for a group. You can play with the sauce ingredient amounts.The leftovers are delicious too, so make extra! The original recipe is Mark Bittman’s. Here is the recipe with thorough directions and variations. 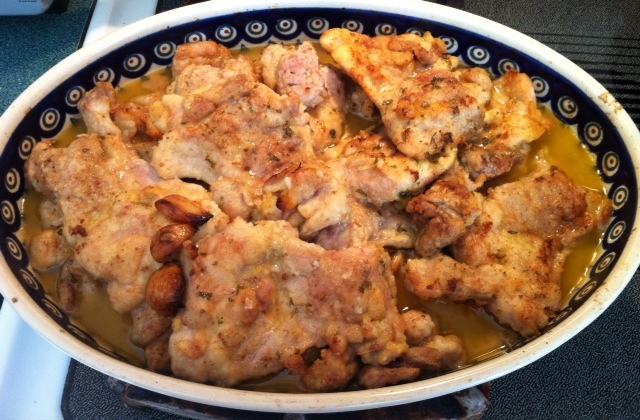 This entry was posted in Recipes and tagged chicken, pan sauce by nebrosseau. Bookmark the permalink. I searched my own blog for dinner ideas tonight. Three hungry men, almost 4 pounds of boneless, skinless chicken thighs with boiled potatoes and corn…..are.all.gone. This really hit the spot. I loved the easy cleanup!